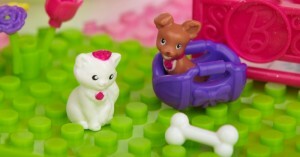 Pretty Pets Barbie® loves to bring her furry friends to the Mega Bloks® Barbie® Build ‘n Style Pet Shop for a “pet-icure”. Treat each pet to a shampoo followed by stylish grooming make-over. Show off the pets’ tail-wagging looks in the moving pet shop window seat! 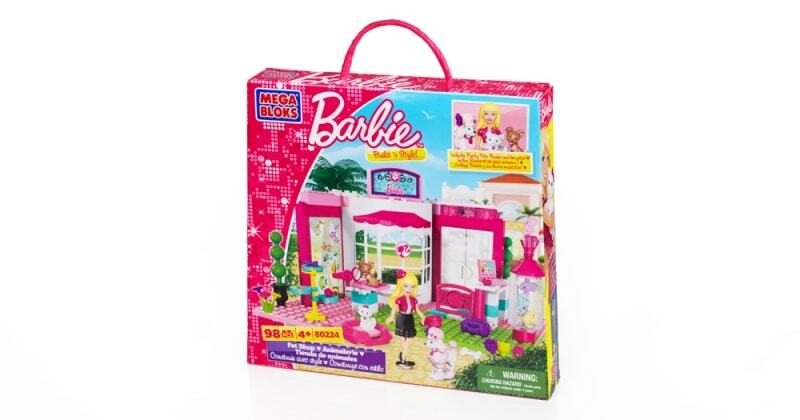 Combine with all of the Mega Bloks® Barbie® playsets to build a fabulous world of fashion, friends and fun! For fans ages 4 and up. ©2013, MEGA Brands Inc. ©2013 Mattel. All Rights Reserved. Young girls will be empowered to build ‘n style their very own Mega Bloks® Barbie® world, with over 300 specially-designed pieces and tons of detailed accessories. Collect up to 19 mini-fashion dolls — including Barbie, Teresa, Nikki and of course Ken — with changeable hair, accessories and clothing styles! There’s lots of great places to shop, like the Fashion Boutique and the Pet Shop. Hang out at home in the personalized Luxury Mansion, relax at the pool or hop in your convertible and head to the beach house! Mega Bloks® Barbie® hit stores this past December. Previous Post: « DIY Heart Braid For Girls: Perfect For Valentine’s Day! We’ve loved MegaBlocks for years…no way I could pick a favorite! My daughter loves to build!!! My daughter like the Hello Kitty Mega Blocks and she does like to build. Thanks for the chance to win! My 3 yr old loves the Hello Kitty Mega Blocks and is just getting into Barbie! She’d love to have the new Barbie Pet Shop Mega Blocks. It’s so adorable! Liked, followed! So glad they are making these things for girls! My granddaughter loves My Little Kitty, so. Am sure that that Mega blocks would be her favorite. my nieces love the hello kitty mega bloks and im sure theyd love to build with this! My daughter loves Hello Kitty and yes sheloves to build! Mega Bloks and Barbie…great combo! We have a lot of different Mega Bloks products and we love them all! Best bloks ever! 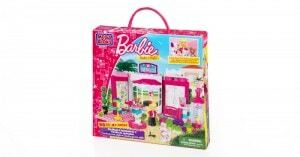 I like the Mega Blocks Barbie Build ‘n Style Pet Shop. And yes, my girls like to build. Oh the Barbie and Hello Kitty are so cute!! Wow…we love Barbies! This would be a awesome prize to win and have fun with! Building with MegaBlocks is such a great thing to do to build spacial relationship knowledge. I know that my daughter and I would enjoy this Barbie MegaBlocks Pet set. The girls love anything barbie. My daughter loves to build and we love the hello kitty schoolhouse! My kids like all of the megabloks lines, my daughter does like to build. My daughter loves to and her fave is the Hello kitty sets.Thanks for the chance. Favorite – Party Time Barbie. Yes the girls love to build! Yes, my daughter likes to build, and we love all the hello kitty products! My daughter likes to build and I like all the Barbie sets! The Build N Style pool party is cute! She loves to build with blocks!!! My daughter loves to build things! i think she’d really like this. And my son really like the CAT toys! My daughter would Love this Barbie Megablocks! My daughters have been playing with Mega Bloks for years…started with the huge ones and here we are now! They love to build and LOVE Barbie! Perfect pairing! My girls like to build, and they like the Hello Kitty ‘Day at the Boardwalk’ from Mega Bloks! My two 4 yr old granddaughters are very creative and love to make things. They have had a variety of Mega Blocks and this would be a great addition. I like the Build and Style Luxury Mansion. The Pet Shop looks like tons of fun. My little niece loves to build and she would love this for her birthday. My daughter really likes the Mansion. She does like to build, but has no Barbie blocks yet. My daughter likes the Hello Kitty blocks and the new Build ‘n Style Beach House. She loves to build. My granddaughters love to build. my daughter loves the barbie mansion! My favorite is their Avengers Set. I love the HK sets! The slumber party Barbie set would be a hit in our house! My granddaughter got some blocks for Christmas and just loves them. I would love to be able to get her the Barbie Build ‘N Style Luxury Mansion. My favorite is the Beach House. My daughters do like building things. The Barbie Mansion is amazing! Yes, Rachel, my granddaughter, loves to build. In fact her teacher said she is really good for her age and my daughter said well, her Dad is an architech. The hello kitty ones are cute. My niece loves to build. Currently, the favorite is the Barbie Mansion, but she really loves all her sets. My favorite is the Build ‘n Style Pool Party. I like the First Builders Deluxe Building Bag. It gives babies the chance to play with blocks safely. All my nieces love to build. the barbie mansion is awesome! and my 4 year old daughter LOVES her legos!